Our guest blogger today is Sylvia Clubine. The area she writes about here is where Gail Lee Martin’s parents and grandparents lived. Gail’s roots go back to Tyro, Kansas in Montgomery County and further back into the Missouri and Arkansas Ozarks. “Over the four-state area where your ancestors once lived, your spirit still lives there. The beauty of the OZARKS runs into S.E. Kansas, but not the total rocky surface that makes the Ozarks mountain areas. Kansas is excellent farm and natural prairie, lush grazing land, plus very lovely rocky ledges and the bottom floor of creeks and rivers with beautiful groves of trees. Near Tyro, you might see an oil tank or a pump jack, bales of hay, some rolling hills. Get away from the highway and you’ll see the open prairie. It’s interesting to drive into a small Kansas town for the first time. Is it thriving or just hanging on? Some have lost population and businesses and all that remains are the empty storefronts and scattered residences. In following this blog about Gail Lee Martin’s life, you’ve already seen some small towns mentioned like Hamilton, Reading, and Tyro. There are a number of posts on the now the extinct Teterville. I’m searching out information about Kansas towns that in some way related to my family history. Along the way, I’ve found some other interesting small Kansas towns to feature as well. My sister wrote about Emporia, Kansas, where our Martin grandparents lived. It’s not as small as Hamilton or Tyro. Emporia is a thriving county seat with a university. If you like poking around small towns, there are plenty in Kansas to explore. There are also full-scale ghost towns where only shabby, collapsing buildings remain to show that people once lived there. Daniel C. Fitzgerald has a series of books featuring these ghost towns. To see what towns are included in each book, click through to Amazon on the VIEW DETAILS buttons below. Teach – I’m originally from small town Kansas, now living in North Dakota but at long last will be moving back to the Yellow Brick Road soon…and looking forward to the time to poke around some of these great little towns! Wednesday-Elf – I’ve spent quite a bit of time in Kansas despite the fact that I came from the East Coast (college [K-State], married a Kansas boy, two of my kids were born in Kansas and one now lives in Kansas City), and I’m partial to both small towns and the State of Kansas! Grannysage – I’ve lived in several Kansas small towns, although I grew up in Michigan. My ex-husband is from Schoenchen which is south of Hays and where my children grew up. We also lived in Stockton which is north of Hays, Salina, and Larned. I also worked in Russell, home of Bob Dole. Right now I am living in Lawrence. There are a lot of historical towns in Kansas, and it is a different lifestyle. Mary Beth Granger – I visited many small Kansas towns during my career as a regional director for H&R Block. Most of the offices I visited were franchises owned by local people…it was always interesting to get to know the people of Kansas small towns. Thanks for the memories. A family memory from 6 years ago today. It gets pretty hot in Kansas but Gail and Clyde were adamant about not using their window air conditioner. Summers could reach 105 degrees during the summers when I was growing up in the 1950s and 1960s. In 2011, knowing that Kansas was suffering through a heatwave even hotter than usual, I asked Mom how they were faring. Melting Fan sculpture. I don’t know who the artist is. Apparently, my sisters were badgering them as well about turning on their air conditioner. Tonda and her daughters cleaned the folks’ house every two weeks. I’m guessing that consideration of their comfort while they worked overcame Mom’s scruples about using the air conditioner. Her daughter, Cindy, messaged too, “We’re thinking our grandson may have gotten a touch of heatstroke from walking to the Park City pool, staying in the heat with the sun reflecting off the water & then walking back again. To say the least, this summer has been hot-hot-hot. Leaves are already falling off the trees. The excessive heat makes me major grumpy & tired. Gail answered her daughters’ concerns with this message, “Thanks, everyone, but I think we will manage. Clyde is afraid we will lose our economy rating with the electric company. One thing I miss is hearing the birds singing. Probably won’t miss hearing all the kid noise or the speeding cars. The unit does make a noise that I don’t like. We were cold during the night, but Clyde is learning to adjust it to not be so cold. Yeah, I have socks and slacks on this morning. The kitchen and the writing room are the warmest places, but fans will take care of that. Gail Lee Martin used to gallivant about the Kansas countryside with her daughters. She’d taught them in childhood about the delights of setting off on an exploratory road trip. Once they were grown, there were still new places to see and new adventures to try. Here’s Gail’s description of such a day’s outing in May 2002. The event is called the Kansas Sampler Festival and it provides a showcase for performers, sights, foods, and anything Kansas related. Next week, May 6 and 7th, 2017 is the last time for this festival. This one is in Winfield. “Well, I had hoped Cindy would tell her side of the weekend and maybe I wouldn’t have so much to talk about. But here goes, my great inspiring weekend. Cindy and I left El Dorado around 1:00 pm on Friday, May 3rd. We went to Independence by way of that new Highway 400, south of El Dorado. We arrived and got checked in at the Lamplighter Motel (the cheap one), then we hunted up the Riverside Zoo and Park, where we found the festival tents all set up in a great, big oval. We were in #8 and were able to set up at the very front on the left side of the entrance. We unloaded and set up Cindy’s booth titled “Meet, Gene Stratton-Porter.” We should have pictures coming when Cindy gets caught up. The group of Historic Performers in our tent included a complete covered wagon campout; a mountain man’s home, he is also a wagon scout, a fur trapper, and his wife is a schoolteacher who travels by wagon train; Amelia Earhart; Calamity Jane; Nolan Sump as a German-American farmer, and a group representing The Santa Fe Trail Experience. Talk about being in good company, these people are such fun. After everyone was set up we adjourned to a Mexican food place and continued to share experiences while chowing down on good food. The next morning we were ready to greet the visiting public by 10:00, all 5,100 of them on Saturday and many more than that on Sunday. Kansas was very well represented from every part of the state. If you didn’t learn about it at the festival if probably isn’t worth seeing. Both days the ones in our tent gave 15-minute performances off and on. Cindy performed 9 different times. Surprisingly, we saw people we knew. Robert and Vickie Griffith from Madison; Teresa Bachman and the Henns from El Dorado; Barbara Booth, a Kansas Authors Club friend from Clay Center; Mary Asher from the Fort Scott’s farmers market. I talked to everyone else as if I knew them and after visiting with them awhile I felt like I did know them. I was honored by one of the golf cart volunteers with a ride to the food vendors area for lunch on Saturday. There were 250 volunteers of all ages that pitched in wherever you needed them. They unloaded and loaded our vehicles, hunted up electrical cords, brought us drinks or ice cream and just made the whole thing run like clockwork. 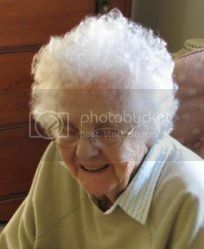 As you can see from her description, Gail loved exploring and trying out new experiences. Gail’s daughter, Cynthia Ross, also wrote about the festival. “I made it through the weekend, meeting a lot of fans of Gene Stratton-Porter, plus two people that think they are related to her–which is very possible since she was the youngest of 12. Two gentlemen visited my booth after they’d seen one of my performances then made a point to hear it a second time. Many tell me they have all her books—which at one point I thought I did as well, then I found out she wrote more than just her novels. My feet and knees hurt from wearing those old, lace-up boots for two days. One neat thing that happened, the birdman was there on the festival grounds with his display and he allowed me to hold one of the owls to get my picture taken in costume. One lady said she wanted me to have her whole collection of Gene’s books, some signed by the author. I told her to let me know a price, although I’ll have to travel some distance to pick them up, but well worth it, that’s if she remembers to call me. Gail Martin saved not just her own memories of early days, but collected memories from her aunts and extended family as well. This is one she inspired her Aunt Bertha McGhee to write and send to ‘The Golden Years‘ magazine for East Central Kansas for Aging. She was so pleased they published this March 1994. In 1932, when they had the WPA, I worked for a year as a caseworker in Chase County. Once I was caught in a tornado and got stuck in a ditch. The tornado, whose funnel cloud we could see north of us, picked up a farm house and set it back down on the other side of the barn with the lady of the house inside. even though it was summer. Down the road about a quarter of a mile, an old rural school building, that was being used for hay storage, was blown away and only fragments could ever be found. back road that didn’t carry much traffic. Gail Martin in the blue shirt. Her aunt, Bertha McGhee in front of her. A McGhee family reunion. Hills in Kansas? 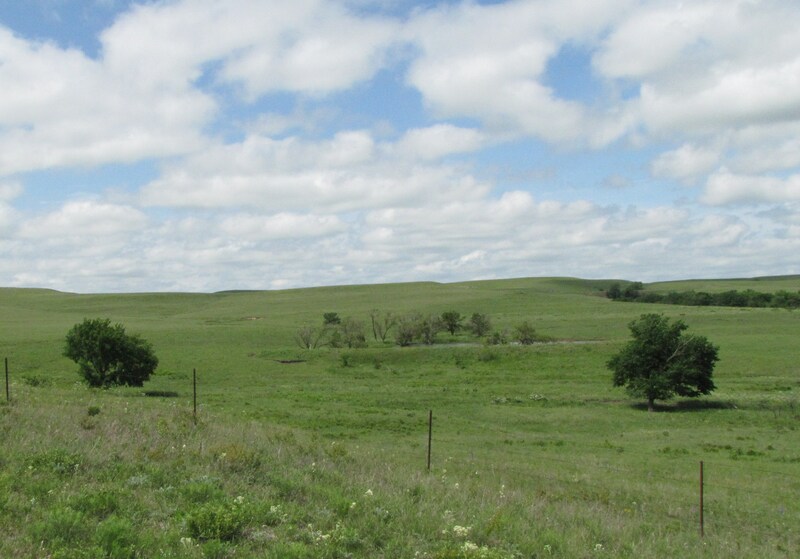 Yes, Kansas has the rolling Flint Hills where you’ll see tall grass prairie, limestone outcroppings, and a sky that goes on forever. It’s in the south-central part of the state. I grew up nearby, and my mother spent her childhood in the Flint Hills. 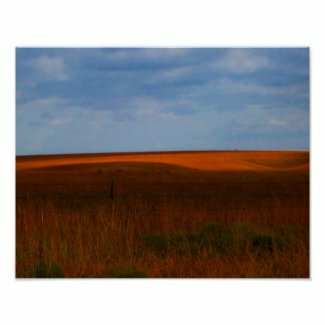 We love the sweeping vistas and subtle folds of the Flint Hills area. It was always a treat to take a scenic drive through the Flint Hills and to watch for windmills, prairie fires and big thunderheads. Photo by Virginia Allain of the Kansas Flint Hills. Anyone who thinks Kansas is flat and featureless has never seen the Flint Hills. In Mom’s book, she talks about the thrill of seeing a prairie wildfire at night sweep across the hills. She loved the prairie wildflowers and taught us the names for some of them. This one is aptly named the butterfly weed. 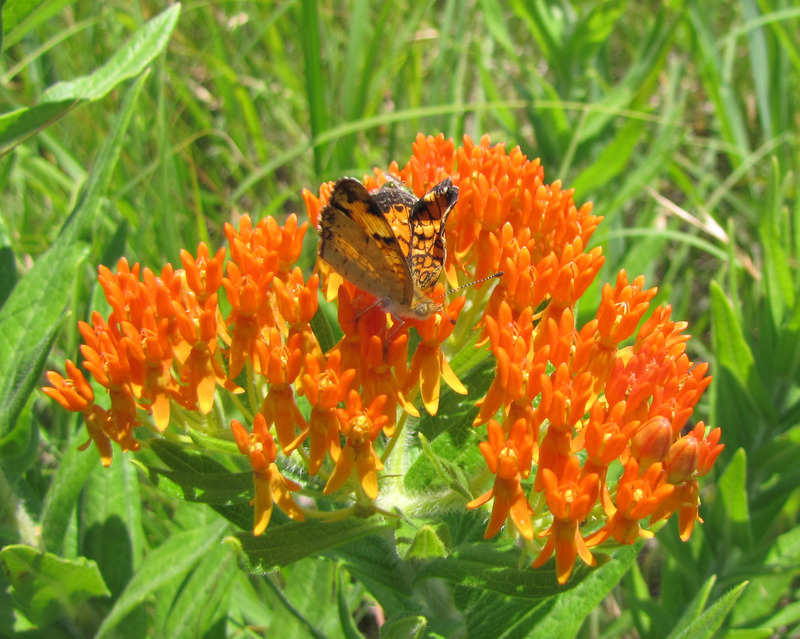 (photo by Virginia Allain) Its official name is Asclepias tuberosa. The hardy wildflowers of the windswept prairie can withstand drought and harsh conditions. Give them a try in your yard. It’s hard to capture the prairie with a camera. Somehow the hills just flatten out under that big sky. As you cruise along in your car with the windows down, pull over now and then at the crest of a hill. Get out and admire the wildflowers. Listen to the sound of the meadowlark and notice the scissortail flycatcher or the hawk on the telephone wire. Let your eyes follow the road as it forms a ribbon through the curves and folds of the land. Note the sparse trees revealing the line of a creek wending through the hills. Savor it. The Flint Hills are a special place much loved by Kansans.